Imagine empowering your students to explore some life-shaping, thought-provoking, Jesus-centered truths that can transform them into the kind of people God crafted them to be. This curriculum will empower students to explore life-shaping, thought-provoking, Jesus-centered truths—and transform them into the kind of people God crafted them to be. Each lesson powerfully reveals what it means to deeply love and trust God, to lead a Jesus-centered life, and to lean on Scripture for guidance and wisdom. Discussions skillfully connect the dots between Scripture’s ancient truths and the issues facing 21st-century teenagers. Lessons are built around four central themes from Scripture: Oneness With God, Sin and Separation, Consequences and Crying Out, and God Hears and Restores. Maximize Impact: Help teenagers discover how to experience hope amid tough times, how God deeply and passionately loves them, how to build an authentic friendship with Jesus, and how God created them to lead a life of impact for him. That’s what LIVE Simple Truth is all about! Each lesson powerfully reveals what it means to deeply love and trust God, to lead a Jesus-centered life, and to lean on Scripture for guidance and wisdom. The discussions skillfully connect the dots between the ancient truths of Scripture and the issues teenagers face living in the 21st century. 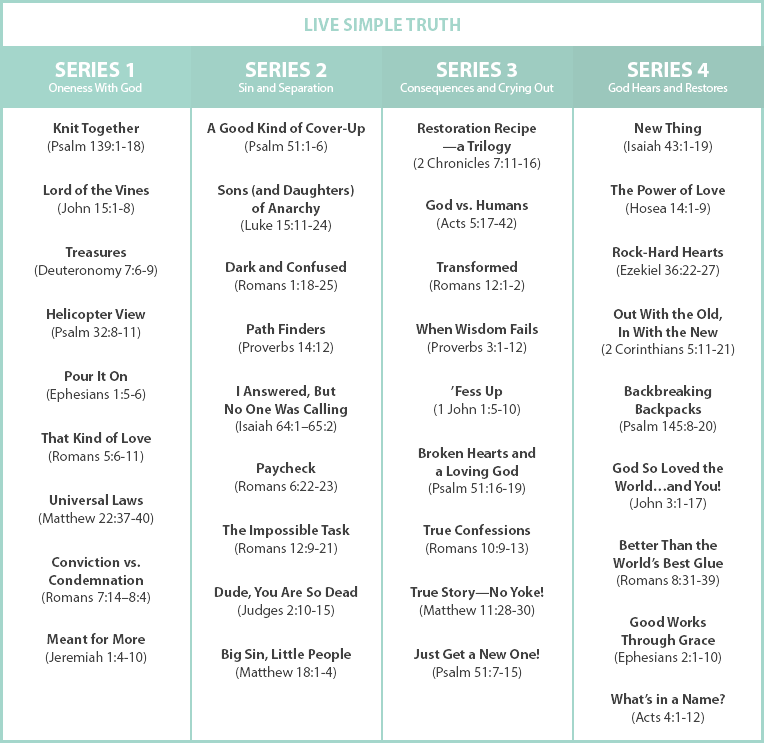 LIVE Simple Truth will help your students join the generation of teenagers committed to experiencing God’s constant, daily presence in their lives! 36 lessons that powerfully reveal what it means to deeply love and trust God, to lead a Jesus-centered life, and to lean on Scripture for guidance and wisdom.